The story of Christ Blessing the Children is found in the Gospels. When children are brought to Christ for blessing, and his disciples raise objections, Christ counters with the words inscribed across the top of this panel: "Suffer the little children to come unto me, and forbid them not: for of such is the kingdom of God" (Mark 10:14). The painting and its pendant, Christ and the Adulteress (seen to the right), share the theme of the free dispensation of divine grace, a central tenet of Lutheranism. Their small size suggests that they were meant for a private setting. Probably made as a pair with Christ and the Adulteress (MMA 1982.60.35), the story of Christ Blessing the Children is found in the gospels of Matthew (19:13–15), Mark (10:13–16), and Luke (18:15–17). Children are brought to Christ for blessing, and his disciples raise objections, which Christ counters with the words inscribed across the top of this panel: "Suffer the little children to come unto me, and forbid them not: for of such is the kingdom of God." This theme, which before the sixteenth century had been confined mostly to manuscript illumination, makes a relatively late appearance in Cranach's oeuvre. His earliest treatments of the subject date to the second half of the 1530s (Städel Museum, Frankfurt; Kunsthalle, Hamburg; Gemäldegalerie, Dresden). These paintings became an extraordinarily popular product of the Cranach workshop and over twenty painted versions are known, most modeled on the standard set by the Christ and the Adulteress pictures: horizontal format, half- to three-quarter-length figures, and black background. The Museum's Christ and the Adulteress and Christ Blessing the Children are unusual among the many variants of these subjects made in Cranach's workshop because of their small size and the likelihood that they were meant as a pair. Although the earliest known provenance of the two panels indicates separate ownership, the remarkably close correspondence in size and appearance and the existence of a pair of old copies in the Schlossmuseum, Gotha, is strong evidence that they were made as pendants. The two paintings are united by the theme of the free dispensation of divine grace, a central tenet of Lutheranism. Their very small size suggests that they were meant for a private setting. Bauman (1984) correctly dated the pictures to the mid-1540s or later and noted the difficulty of distinguishing the hands of Cranach the Elder and Cranach the Younger at this stage; however, affinities with large works from the second half of the 1540s associated with Cranach the Younger make it reasonable to say that the two MMA pictures date between 1545 and 1550 and are closer in manner to Cranach the Younger than to his father, despite the widespread collaboration and stylistic cross-pollination that must have taken place in the workshop at the time. The support of this painting is a beech panel with a vertical grain. It has been trimmed, thinned, laminated to a mahogany panel, and cradled. Strips of mahogany .64 centimeters wide were attached with nails to the sides and bottom. The panel displays a slightly corrugated surface and a minimal transverse convex warp. At right there is a split running from top to bottom and three small splits extending from the bottom. The support was also prepared with a white ground. Overall the painting is in very good condition. As in the pendant, fine details—here, ruffles, jewelry, and lace—were created with precise, fluid strokes of black and creamy white paint, and the outlines of the facial features and hands are indicated with brown paint, the eyelids and pupils with deep black. The warm, medium brown base tone of the hair of most of the figures is enlivened with touches of red or gold and enhanced with strokes of creamy white, yellow, brown, and black that describe curls and strands. Here, too, infrared reflectography revealed extensive monochrome gray undermodeling. The form of Christ’s robe was essentially achieved by scumbling a translucent blue paint over the undermodeling. The lower portion of the white underdress of the women in green at left is underpainted with black, a feature that is also visible in normal light. There are a few lines of drawing describing the folds but no modeling under the red dress with yellow highlights worn by the woman to Christ’s right. During painting, a change was made in the position of the hobbyhorse held by the child at the lower left. Cambridge, Mass. Germanic Museum. "German Paintings of the Fifteenth and Sixteenth Centuries," June 5–September 30, 1936, no. 9 (as by Lucas Cranach the Elder, lent by Mr. Henry Schniewind). New York. Duveen. "Cranach Loan Exhibition," May 1–31, 1960, no. 8 (lent by Mr. and Mrs. Jack Linsky). THIS WORK MAY NOT BE LENT, BY TERMS OF ITS ACQUISITION BY THE METROPOLITAN MUSEUM OF ART. Charles L. Kuhn. A Catalogue of German Paintings of the Middle Ages and Renaissance in American Collections. Cambridge, Mass., 1936, p. 36, no. 83, as by Lucas Cranach the Elder, in the collection of Henry Schniewind, New York; calls it the companion to "Christ and the Adulteress" (MMA 1982.60.35), which he dates about 1520, reading the wings of the dragon emblem as extended. Christiane D. Andersson. "Religiöse Bilder Cranachs im Dienste der Reformation." Humanismus und Reformation als Kulturelle Kräfte in der Deutschen Geschichte: Ein Tagungsbericht. Ed. Lewis W. Spitz. Berlin, 1981, p. 59 n. 57, lists it, erroneously as still in the collection of Henry Schniewind, among versions of this subject by Cranach or his workshop. Guy C. Bauman in The Jack and Belle Linsky Collection in The Metropolitan Museum of Art. New York, 1984, pp. 101–4, no. 37, ill. (color), states that the agreement in style and format indicates that the two MMA panels must have been conceived together and dates them to the mid-1640s, noting that it is especially difficult to distinguish between the work of Lucas Cranach the Elder and the Younger in paintings of this period; mentions that Lucas the Younger's painting "Saint John the Baptist Preaching" (Herzog Anton Ulrich-Museum, Braunschweig), dated 1549, is very close in style to the two MMA panels, and that the probable participation of Lucas the Younger in this panel is also indicated by the similar conception of his drawing of the same subject (Museum der bildenden Künste, Leipzig) and by the sweet expressions on the faces; mistakenly identifies the two MMA pictures with two copies after them in Gotha [see Notes]; states that Cranach the Elder was apparently the first artist to make panel paintings of this subject, adding that at least sixteen versions by him and his workshop survive; notes that the compositions of both MMA panels are unique among the surviving versions. Guy Bauman in The Metropolitan Museum of Art: Notable Acquisitions, 1983–1984. New York, 1984, pp. 57–58, ill., states that these two panels exemplify the influence of the Lutheran Reformation on Cranach's imagery. Katharine Baetjer. European Paintings in The Metropolitan Museum of Art by Artists Born Before 1865: A Summary Catalogue. New York, 1995, p. 221, ill.
Peter Klein. Letter to The Metropolitan Museum of Art. April 3, 2006, identifies the wood of the panel as beech, adding that it is cut tangentially with an insufficient number of growth rings for dendrochronological analysis. Ewa Wilkojc. 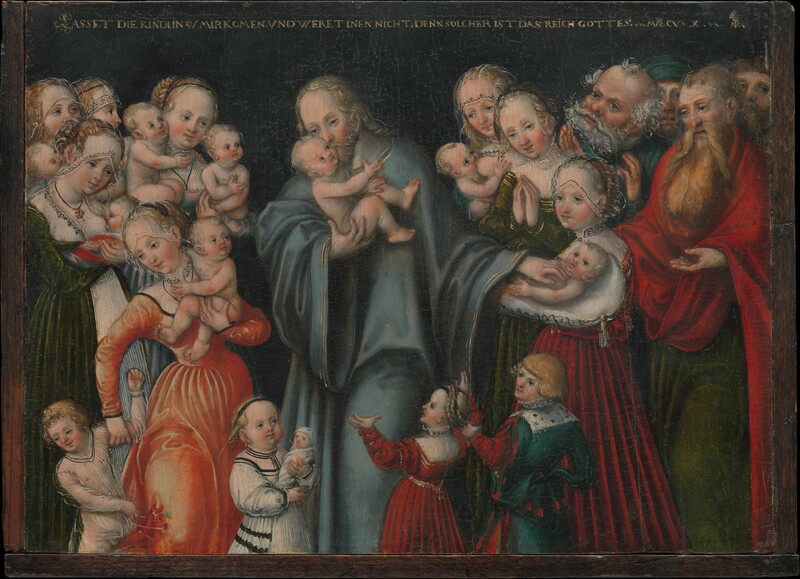 "Christ Blessing the Children" by Lucas Cranach the Elder in the Collection of the Wawel Royal Castle: Study and Conservation. Kraków, 2012. Joshua Waterman in German Paintings in The Metropolitan Museum of Art, 1350–1600. New Haven, 2013, pp. 98–102, 294–95, no. 22B, ill. (color) and fig. 84 (x-radiograph detail). Thomas E. Rassieur in Martin Luther and the Reformation. Exh. cat., Morgan Library & Museum, New York. [Dresden], 2016, pp. 428–29. Central Europe (including Germany), 1400-1600 A.D.